Diamond grading is both a science and an art, requiring attention to detail and recognition of the uniqueness of each stone. Perhaps this is why John King, GIA’s chief quality officer since 2008 and an acclaimed artist in his own right, has achieved worldwide recognition for his trailblazing work in the field of colored diamonds. After obtaining a BFA at Wayne State University and an MFA at Hunter College, King began his career at the Institute as a diamond grader, earning his GG in 1979. 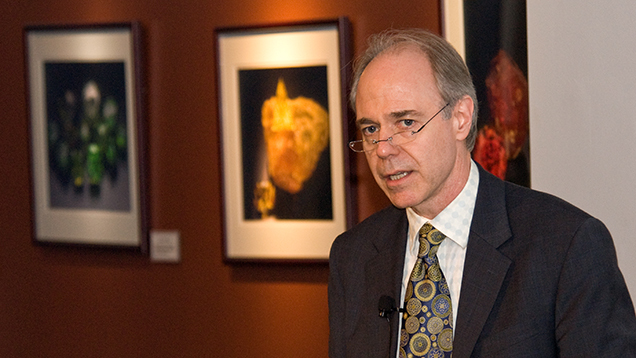 His academic focus on color theory, color naming, and order systems influenced his later work as a laboratory project officer on grading some of the world’s most famous colored diamonds, including the legendary Hope at the Smithsonian Institution (1988) and the Centenary, the largest D-color Flawless or Internally Flawless diamond seen at the time of its grading (1994). He was named GIA’s Staff Member of the Year in 1993, one year prior to becoming the lab’s project officer. During the 1990s, King’s eye for color and grading expertise led to his work in refining and revising the terminology used for colored diamond grading reports issued by GIA. His work led to the publication of several groundbreaking articles on colored diamond characteristics and grading factors, including those pertaining specifically to blue, pink, and yellow material. Of his many published articles, nine have received G&G’s Most Valuable Article award. He also served as editor of G&G in Review: Colored Diamonds (2006), a compilation of the journal’s most notable articles on the topic. Additionally, King has acted as an ambassador on GIA’s behalf, lecturing extensively on topics relating to colored diamonds, laboratory grading, and gemological research. Outside of his work at the Institute, King is a widely respected artist, working in various mediums. For nearly three decades, he has shown his work at exhibitions held around the world, including at the Library of Congress, the Brooklyn Museum, and the Vicenza Art Fair (Italy), making clear that his eye for beauty translates outside of the gemological laboratory. King has been awarded both the NEA Fellowship Grant and the Pollock-Krasner Foundation grant for his artistic endeavors. His experience in both the lab setting and the art studio has helped pave the way to a greater understanding and wider appreciation for colored diamonds. Stories of leaders who have shaped GIA, from past to present. This article reviews the GIA Laboratory’s history of reporting on certain types of graining which are often the only characteristics present in large, high-clarity, high-color diamonds. More than 400 blue diamonds were studied at the GIA Gem Trade Laboratory over several years to reveal additional information about the relationships between their color, clarity, and other gemological properties. Explore a comprehensive timeline detailing GIA's scientific and educational development since 1931.